The house contains four bedrooms - two king-size double bedrooms fully en-suite, a twin bedroom and a bunk bedroom sharing a third bathroom, a large open-plan living, cooking and dining area leading to a conservatory facing South-West onto the Atlantic. One of the Double Bedrooms This new bungalow sits at the edge of a secluded, sandy and protected beach at Claddach Kirkibost, on the island of North Uist. The house has been constructed and fitted to the highest standards â€“ less than 3% of Self-Catering properties examined by the Scottish Tourist Board qualify for the top 5 Star grade of â€œExceptionalâ€. Accommodation consists of 4 bedrooms (2 king-size master bedrooms each with en-suite shower, toilet and WHB + 1 twin bedroom fitted with adult single beds + 1 bedroom containing adult-sized bunk beds sharing bath, shower, toilet, WHB & bidet), large open-plan living room incorporating fully-fitted electric kitchen (hob, oven, microwave, dishwasher, fridge and integrated washer/tumble dryer) and breakfast bar, and a conservatory for relaxing with coffee and after-dinner drinks. A deep-freeze is located in the side-porch. Parking is available. Satellite TV, DVD, CD & VCR are installed. The property is equipped with full oil-fired central heating throughout, underfloor tile heating in en-suite areas + a coal/wood/peat open fire in the open-plan living area. There is ramped access for a wheelchair. A cot & highchair are available. 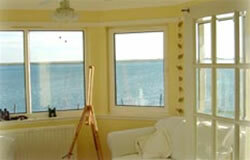 Tigh-na-Mara sleeps 8 adults in comfort and is ideal for a relaxed two-family Hebridean holiday. It is equipped with four mountain bikes, four fishing rods, two sets of golf clubs, table tennis and a selection of indoor board games. The area is ideal for bird-watching (RSPB reserve), angling, watersports and hill-walking with a nine-hole golf course located 8 miles away.